The long, cold winter can be a depressing prospect for many. The threat of cabin fever looms large as we battle through the snow to get from one warm place to another. Sledging adventures and snowball fights offer a brief respite from the numbing, bitter cold. Braving the elements for the daily commute can be torture without the right gear. A warm coat, scarf, and hat is a given, but what can technology do to help? Let’s take a look at some high tech winter gear to keep you cozy until the spring thaw. Everything is better with music and the right choice of tunes can transform barren, icy tundra into a winter wonderland. 180s combine behind the head earmuff designs with built-in headphones so you can keep your ears warm and enjoy good music at the same time. 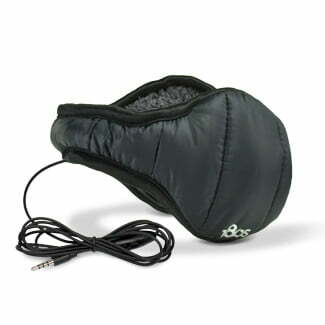 Your ears will feel great as they are protected by this down filled, water resistant shell with a faux Sherpa lining. The standard audio jack will work with most smartphones and there’s even a microphone for hands-free calls, which means you don’t need to get that phone out of your pocket in the cold. There are actually quite a few options when it comes to warm gloves that will work with a touchscreen now, but these NuTouch Gloves offer great value for money. 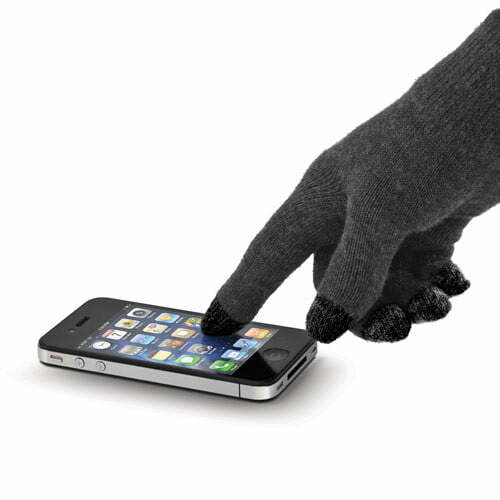 They are comfortable, they are fairly warm, and all ten tips will work well with your smartphone touchscreen. The classic charcoal color isn’t too eye-catching and the fingertips contrast in a darker color. 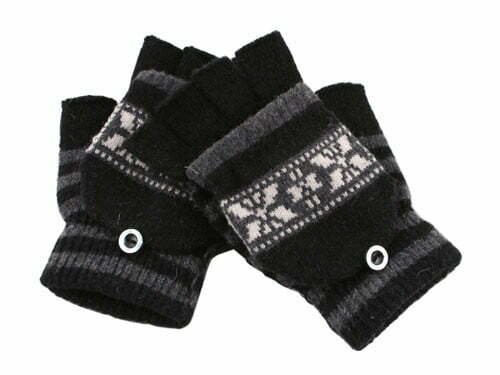 You can wear thicker gloves over these if it’s really cold outside. If you’ve had that feeling that your toes are going to fall victim to frostbite then you’ll appreciate the idea behind Colombia’s Bugaboots. 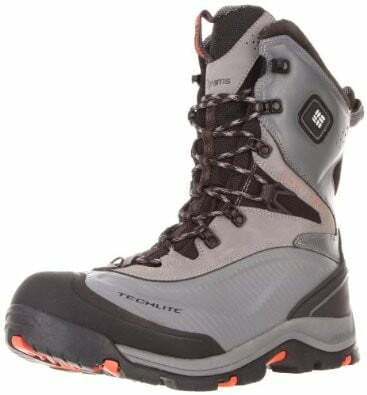 These boots are equipped with Colombia’s Omni Heat technology. They are completely waterproof and you can press a button on the side to activate battery-powered warmth immediately. They have three warmth settings and you can get an extra battery pack to give them a boost on extended trips. Colombia also offers Bugagloves and Electro Amp core vests for men and women that work in exactly the same way. We took their electric jacket for a test drive. Fool of a Took! If ear muffs aren’t enough, go for a beanie hat with built-in headphones. 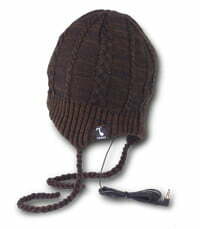 You’ll find various styles of hat available from Tooks and the headphones have a standard 3.5mm stereo plug. The nice thing about these is that you can easily remove the headphones and machine wash the beanie when you need to. Not everyone will want to spend $250 on a pair of electric boots, so for a tenth of the price you can enjoy toasty feet thanks to these heated socks. They run on batteries, one D battery for each sock. You can set them to a low or high heat and you’ll get 12 or 10 hours of warmth accordingly. 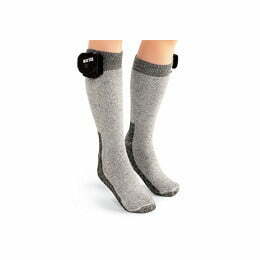 They come with a lifetime guarantee so you need never have cold feet again. 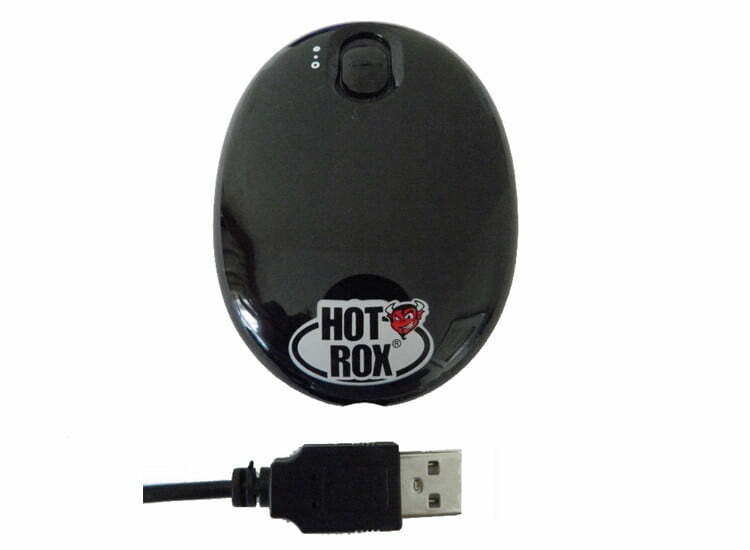 This pebble-shaped hand warmer slips easily into your pocket and can be turned on for a blast of heat when you need it. It has two heat settings offering between 3 and 6 hours of warmth. You can charge it from the wall outlet, but this one also comes with a USB cord so you can plug into a PC at work to recharge. The underside of the device heats up quickly and it’s perfect for warming your hands as you wait for a bus or train. Try Firebox for U.S. delivery. It’s official. You can literally get anything as a USB accessory now. We’ve all experienced cold hands as we type in a chilly room. Why suffer? Grab a pair of these gloves, slip them on, plug them into your computer and warmth will regenerate those fingers. You may even find your typing speed improves as a result, but if you’re in the office expect some funny looks from co-workers. Here’s a warm winter jacket that is all about keeping your favorite electronics close and hidden. It has 26 pockets to hold everything from your glasses and your smartphone up to an iPad. The hood and sleeves are removable for temperature control. It also features wire management for headphones. 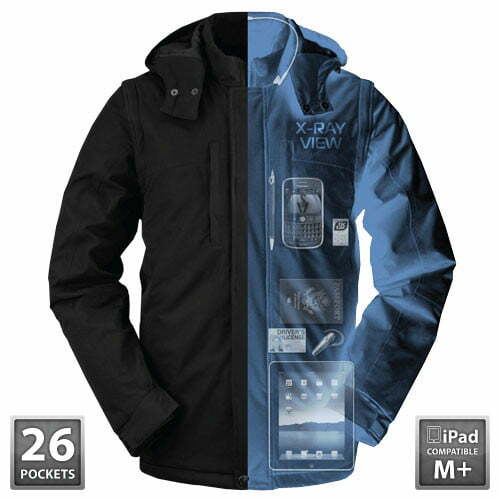 With this jacket you can effectively load up all of your electronics and keep them safely stowed about your person. The internal clear touch pockets even allow you to operate touchscreens without removing the device. We took a look at their fleece jacket a while back. This high tech winter gear should be enough to see you through to spring. If there is any other great winter tech device or clothing that you swear by then post a comment and share.